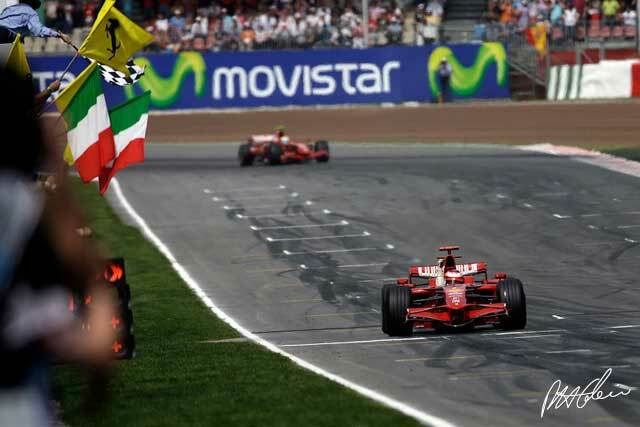 There was not a great deal to analyse about the Spanish Grand Prix of 2008. The Finnish journalists in the F1 Paddock reckoned before the race that Kimi Raikkonen would lead from start to finish and even keep the lead during the pits stops. They were wrong, but not by much. As it turned out they found themselves rather busy as Heikki Kovalainen suffered what looked like a wheel failure while leading during the first pit stops. He was due to pit at the end of the lap but instead the McLaren speared off the track at high speed and went heavily into the tyre barriers, with almost no deflection. The safety systems worked perfectly but there were still worries as the McLaren buried itself beneath the heavy rubber and a gaggle of marshals had trouble pulling it out to release the Finn. The impact was estimated to have been 26g and Heikki got a heavy bang on the head. The incident was reminiscent of the one that Lewis Hamilton suffered during qualifying last year at the European GP at the Nurburgring. As we were closing for press there was no confirmation of the cause of the crash but from the in-car footage it is clear that it was either a tyre or wheel failure. It was sad to relate that the accident also ruined the chances of Nick Heidfeld, who found himself in the lead after Kovalainen crashed. This was a disaster for the BMW team as not only was Heidfeld forced to lose ground because of the Safety Car but then he was forced to go into the pits when the pit road was closed. It was either that or run out of fuel. This meant he had to complete a penalty stop and he ended up out of the points. This seemed to be rather unfair, as there was nothing that Heidfeld could have done to avoid the penalty. Given that the team started the race leading the Constructors' Championship this was a tough penalty and one that the FIA would be wise to review. Heidfeld never had any real chance of a victory, but in truth after the first corner no-one did. "It's very hard to pass here," said Raikkonen. "The best place to win is from the front." Kimi did what was needed at the start and his team-mate Felipe Massa got away quickly enough to get ahead of Fernando Alonso. Behind the local hero Lewis Hamilton blasted off with a typically aggressive and well-judged start. This got him ahead of Robert Kubica but he was then stuck behind Alonso. Everyone apart from the Spanish fans knew that Fernando would not stay out long because the Renault had only qualified second in an effort to put F1 on the front pages again. It was a sad sign of Renault's weakness that this was necessary and confirmation of the desperation came after only 16 laps as Alonso peeled off into the pits. Massa was the first of the others to pit and he stayed out three laps more. Raikkonen went one further than that and Hamilton pitted having done five laps more than Alonso. Robert Kubica pitted at the same time as Hamilton and Heidfeld did eight laps more than the Renault. The first lap of the race was disrupted by a Safety Car which was not a surprise given the desperation that there was for drivers to make an immediate impact. Sebastian Vettel was taken out (again). This time it was Adrian Sutil's fault as he bounced off a kerb, hit David Coulthard's Red Bull and then spun into Vettel's path. It was not the kind of thing that Sutil needs to be doing as there is pressure on him to perform. Other collisions took out Sebastien Bourdais and Nelson Piquet. The Brazilian had messed up his race before that by going off and was trying to get back up through the field and dived down the inside of the Frenchman. It looked as though the Frenchman never saw the Renault, as he turned into its path and that was that for the pair of them. Later on Rubens Barrichello and Giancarlo Fisichella collided in the pitlane. Barrichello was leaving his pit and Fisichella trying to get to his and the result was that Barrichello damaged the nose of his car and in the course of the lap that followed all the aerodynamic parts were punished and in the end Barrichello parked the car. Up at the front the Safety Car for Kovalainen's crash disrupted Raikkonen's afternoon but did not real damage. He judged the restart well and disappeared up the road, pacing himself on Massa and Hamilton. He had a slight delay during the second pit stop. He was delighted to be winning again. Massa knew that second was his place from the first corner onwards and stayed out of trouble, while Hamilton knew that he could not really challenge and so was happy to be third. He was chased home by Kubica. Fifth place went to Mark Webber after Alonso's race ended with an engine failure. Jenson Button finished sixth to give Honda its first points of the year. The car was good and Jenson set the fifth fastest lap of the race. "The safety car came out at the wrong time for us, " Jenson explained. "I was on a long first stint so it was bad timing and definitely cost me some places. The car was working well with the balance improving lap by lap, particularly on the last stint with harder tyres where I felt very comfortable. The team is doing a really good job." Williams picked up two points for seventh but the ought to have got more. Kazuki Nakajima did a decent job but Nico Rosberg was running ahead of him when he suffered an engine failure. Toyota might have beaten Williams on this occasion but a misunderstanding led to a confused pit stop and Jarno Trulli lost time, but at least picked up the final point. It was not a great race by any means. The Circuit de Catalunya is famous for producing dull races and this was no different to normal.